Crush basil leaves in a mortar with salt a few at a time. Add the garlic to mortar, and pound to a paste. Add pine nuts, and crush them into the paste. Add the cheese, and work into the paste. Add the olive oil one tablespoon at a time. Keep working until you have a creamy paste. 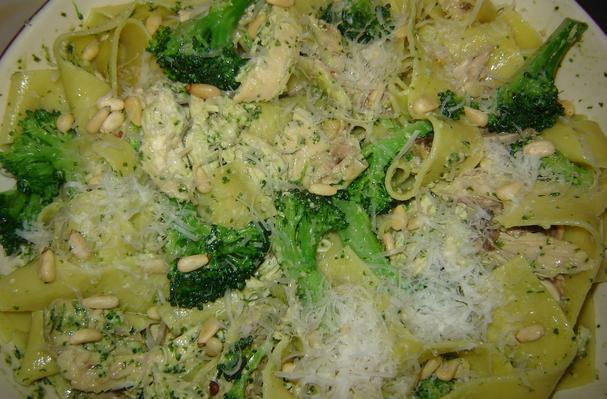 Mix pesto with cream, to a pourable, sauce-like consistency. Set aside. Drop pasta into boiling salted water. About 4 minutes before the pasta has finished cooking, add the broccoli to the pan and allow it to cook with the pasta. Drain the pasta, reserving 1 cup of pasta water. Drizzle a little olive oil over the pasta. Return the empty pot to heat, with 1 tablespoon olive oil. Add the chicken to pan and heat through - about 1 minute. Return the pasta and broccoli to the pan. Pour over the pesto and cream. Toss everything gently together over the heat, until the sauce is warmed through and coats everything well. Loosen sauce with reserved pasta water if necessary. Sprinkle toasted pine nuts and grated parmesan over the top. Serve with extra parmesan. This is one of those great pasta dishes, that with a little bit of before-hand preparation (some of which can even be done the day before) comes together in just a few minutes at the end. Literally as long as it takes to boil water and cook pasta - about 15 minutes max! It's also another one of those "everything in one bowl" dinners that I love. Let's begin with the pesto. I have to be honest and say that for years I have always bought ready-made pesto and never bothered to make my own. Until recently when a nasty experience with a store bought pesto inspired me to try making my own, and have been astounded to discover just how much better it tastes. What's more pesto can be frozen, so you can enjoy home-made pesto long after basil season has finished, and it's an absolute breeze to make. I have been using this recipe by Lidia Bastianich and to begin with I was just using the "bung everything in the food processor" method - not that there's anything wrong with that. However, more recently I have begun using the mortar and pestle and doing it by hand and the results are just outstanding - the texture is far superior and every ingredient seems to retain its individual characteristics. Additional advantages of this method are, firstly, much less cleaning up, and secondly, the triceps get a good work-out - say goodbye to those "flappy" upper arms! So this can easily be made the day before, or even several days before for that matter. If you have made it in advance, I recommend that you take it out of the fridge an hour or two before you want to use it to return to room temperature. Also if you are making it in advance, I suggest that you don't put all of the oil that is asked for into the pesto while you are mixing it up - just reserve a teaspoon or two. Then put your finished pesto into a small dish or bowl, and try to level out the top as much as possible. Then pour the reserved oil in a thin layer over the top, completely covering it - this helps to stop the pesto from turning brown on exposure to the air, and that oil can just be mixed into the pesto before you use it. Now for the chicken. You could use chicken thighs or breasts for this, cut into pieces, tossed in a little bit of olive oil, lemon juice, salt, pepper, and fresh rosemary, and then sauteed. Personally, I always use free-range, organic chicken, but have found that buying individual pieces seems to be hellishly expensive. Solution - I buy a whole chicken, roast it, use half for this recipe, then use the other half for something else (often a chicken and seafood paella) the next night. I like to butterfly my chicken and remove the backbone. (The backbone then goes into a large snaplock bag in the freezer - ditto any leftover chicken from a roast chicken dinner - and once the bag is full the whole lot gets made into chicken stock.) The chicken is then laid out flat, drizzled with a little olive oil and seasoned on the inside. Then flipped over, drizzled again with a little olive oil, and more salt and pepper. Then I might further season one half of the chicken with perhaps lemon juice and rosemary (for this recipe) and the other half with perhaps paprika and oregano for the paella, or some other seasoning that would be appropriate for its intended end purpose. So this is the beauty of butterflying - it is really easy to treat each half of the chicken separately. The chicken then gets roasted at 180 degrees for about 45 minutes to an hour depending on the size of the bird. Once roasted and cooled enough to handle, I remove all the flesh from the chicken, putting each half into a separate container and into the fridge. This can be done several hours before you need it or even the day before. Once all the flesh has been removed from the carcass, and the carcass is completely cold, it then joins the backbone in the freezer bag for stock. Not much to the broccoli really - this just gets cut into florets, and of course this could also be done well in advance. Actually, I often use broad beans (fresh or frozen) instead of broccoli in this recipe, and they too can be blanched and shelled well ahead of time. My preferred pasta for this recipe is an egg pappardelle, but you could use any pasta that you like.